"This is Classie" Ellita "de Nanrox at 6 monthe old. She participates in agility and herding and we will soon start flyball, scenting and skijoring. She's very quiet in the house and loves to play fetch outside." 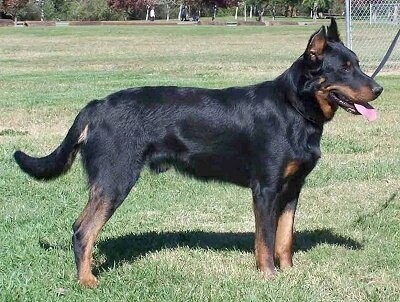 The Beauceron is a large, athletic, working dog. The body is slightly longer than it is tall. The head is long and in proportion with the body. The skull is equal in length with the narrow, pointed or excessively broad muzzle. The stop is slightly pronounced. The dark brown eyes are horizontal and slightly oval. The half pricked or drop-ears are set high, either cropped or left natural. The AKC standard calls for double dewclaws on each rear leg and disqualifies a dog that does not have them. The tail is fringed, carried low reaching at least to the hock forming the shape of a "J." The smooth, short double-coat has longer hair on both the tail and hindquarters. The outer coat is harsh while the undercoat is soft and silky. It comes in black with distinct tan markings and in a less common harlequin coat with patches of gray, black and tan. The harlequin coats should have more black than gray with no white. In the black and tan dogs, the tan markings appear in two dots above the eyes, on the sides of the muzzle, fading off to the cheeks, but do not reach the underside of the ears. Also on the throat , under the tail and on the legs and the chest. Tan markings on the chest should appear as two spots, but a chest plate is acceptable. 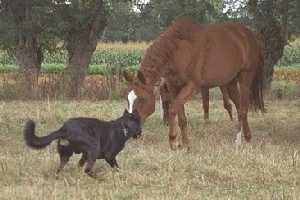 The Beauceron is a brave, highly intelligent, obedient, working dog. Eager and willing to please, it excels at obedience training, very quick to understand and respond to its master’s commands. 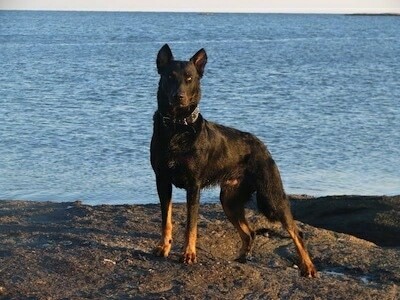 The Beauceron is capable of police work, as it is loyal, patient, faithful, fearless and keenly watchful, able to detect danger. It is a worthy, natural guard dog that loves to work and exercise in wide open spaces. Another one of its many talents is working as a herding dog. It may attempt to herd humans and anything else in its sight and need to be taught this is not acceptable. There are places you can take dogs where they can demonstrate herding ability with flocks of sheep. This is an excellent way for them to release energy at the same time working their minds. With enough exercise your Beauceron will be calm. It will be good with dogs it knows and can learn to get along with other dogs and cats. It should not be left alone for long periods of time without exercise. Thorough training with a firm master is a must, along with the proper amount of exercise and a firm pack leader, in order to produce a tranquil, obedient dog. Socialize very thoroughly when young to combat aggressive tendencies and be sure to keep the dog under control when other dogs are present. Teach this dog respect for humans by not allowing it to jump up and not allowing it to enter doorways first. The humans must make the dog heel beside or behind them when walking. It has given outstanding results as a guardian of property, but is at the same time esteemed as a companion dog. The objective in training this dog is to achieve pack leader status. It is a natural instinct for a dog to have anorder in their pack. When we humans live with dogs, we become their pack. The entire pack cooperates under a single leader; lines are clearly defined and rules are set. You and all other humans MUST be higher up in the order than the dog. That is the only way your relationship can be a success. 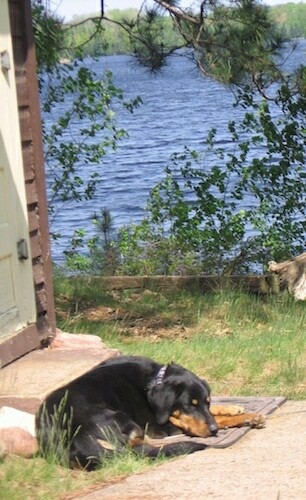 When properly trained and socialized, this is a very good dog and a great family companion. It needs to know who is boss and then it will follow, but keep in mind, this very protective dog will only follow a strong-minded being. If it is stronger minded than you are, it will expect YOU to follow IT. 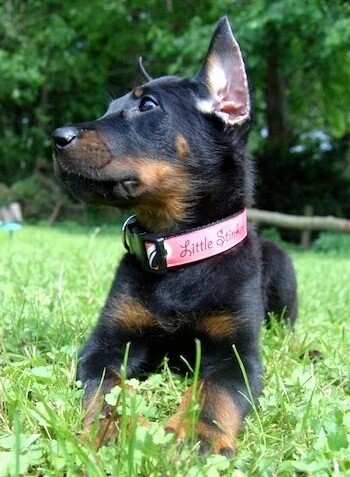 The Beauceron is generally good with children if it sees humans as its authority figures and it has been socialized. It will obey commands from all members of the family. This large energetic breed grows quickly, reaching 40 pounds at only about 3 months of age. It can be overwhelming to a small child. Puppies are very active and slow to mature. The Beauceron should be properly and thoroughly socialized. A Beauceron that has been well socialized and brought up gets along fine under normal circumstances with children, and that also ensures that other dogs and pets will present no problems. 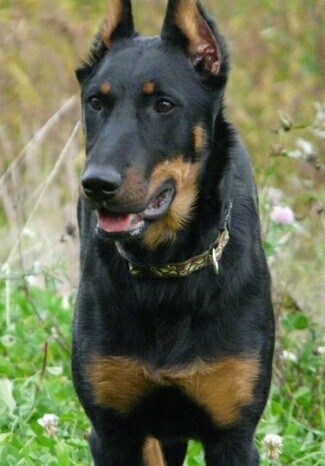 The Beauceron is generally a healthy, hardy breed. Some lines are prone to bloat and like any breed over 40 pounds, Beaucerons are prone to hip dysplasia. Ninety-five percent of all breeders in the U.S. breed only hip certified stock. The Beauceron will do okay in an apartment if it is sufficiently exercised. They are moderately active indoors and will do best with at least a large yard. The Beauceron is a working breed that needs a lot of both mental and physical exercise. They do best with some type of job to do. If their bodies and minds are not adequately fulfilled they will be hard to handle and destructive. They are not satisfied with a circling of the block three times a day. They need variety. Take them for regular long walks, during which they can run free off the leash and play (in a safe area). If both of you seem to enjoy it, enroll in a course to train in catch or to compete in agility skill classes (although in competition it is likely to be less successful than other more suitable breeds). Teach this dog to respect humans, heeling on the lead, entering and exiting gate and doorways after the people. The coat of the Beauceron does not require a great deal of attention. An occasional grooming with more attention during the time when the dog is shedding is sufficient. Beaucerons are average shedders. 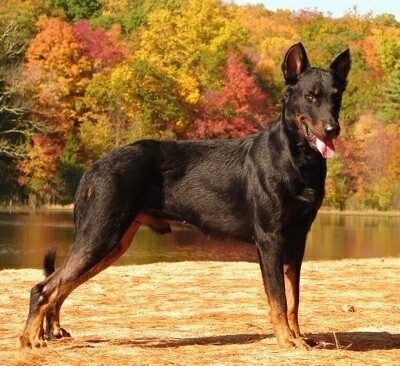 The Beauceron is rare inside the United States. It is a French herding breed whose oldest records date back to the Renaissance manuscripts of 1578. In 1863 a man named Pierre Megnin differentiated two types of sheepdogs, one with a long coat, which became known as the Briard, and the other with a short coat, which became the Beauceron. In 1863 the Beauceron was shown in the first Canine Exposition in Paris. 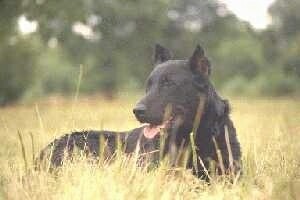 In 1897 the first shepherd dog club was founded and both the Beauceron and the Briard were accepted into it. Prior to 1889 the Beauceron and Briard had a reputation of being a flock guard who was brave but one who was more incline to snap and bite in defense of its flock. Both breeds’ temperaments were softened through selective breeding. In 1889, the breed name and standard were set. 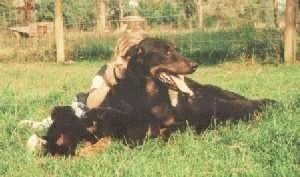 In 1911 a separate breed club was formed just for the Beauceron, officially setting it apart from the Briard. 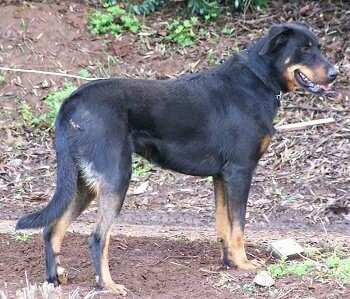 The Beauceron works as a flock guard in open areas protecting sheep along with other livestock. The breed was also used in the military. Ignoring exploding bombs or artillery fire, the dogs were used to run messages, detect mines, pick up trails, support commando actions, find the wounded, and carry food and ammunition to the front lines. The Beauceron, like many sheep herding breeds, is easy to train for tasks beyond care of the flock or herd. His calmness and ability to follow commands without hesitation was well illustrated during both major wars in Europe. Today this serious working dog is still used as a herder, a guard dog and by the French police and army. The breed is gaining popularity in Western Europe and North America as a family watchdog and companion, but they are still rare. 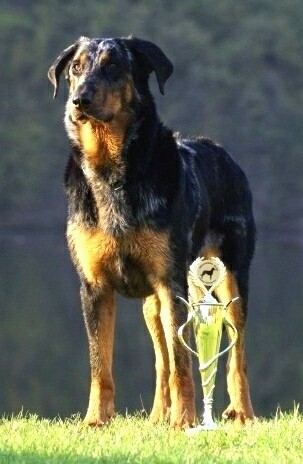 The Beauceron was accepted into the AKC in 2006 under the herding group. Some of the Beaucerons talents are tracking, herding, watchdog, guarding, police work, military work, agility, competitive obedience, French Ring Sport and Schutzhund. 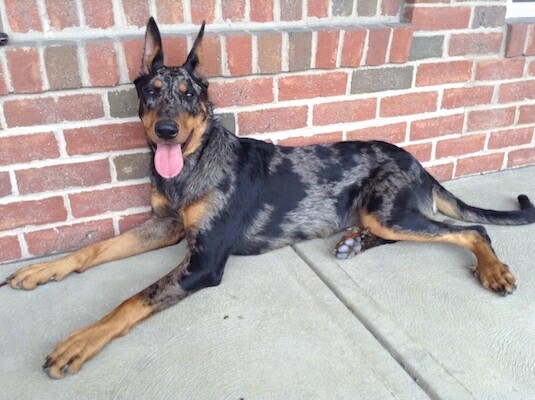 IntCH Arc's Un Reve Realise CGCA RA (Camo) the harlequin Beauceron at 8 months old—"Camo is currently competing in AKC Obedience, Rally and Confirmation. She is also training for Agility. 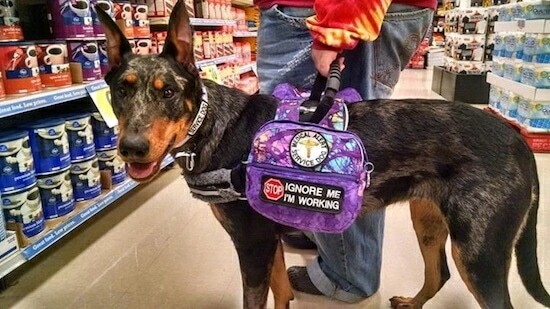 And she is a Medical Alert/Mobility Service Dog. 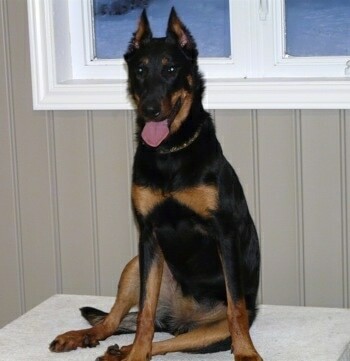 Camo has a lot of down time to play with her Dober-siblings and dream of new ways to challenge her owner." IntCH Arc's Un Reve Realise CGCA RA (Camo) the harlequin Beauceron at 8 months old working as a Medical Alert/Mobility Service Dog. 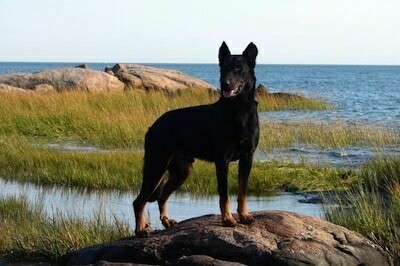 Abbee the Beauceron at 6 months old—"We got Abbee the Beauceron at 6 months old from a rescue. We were told she was aggressive and unadoptable. She was the total opposite within a week of us having her in our home. She carries all of the traits listed in your info page to the letter! Definitely a breed that is misunderstood, as many protection dogs are. We've put a lot of time and effort into educating ourselves and have been rewarded many times over for doing so by having such a great dog!" 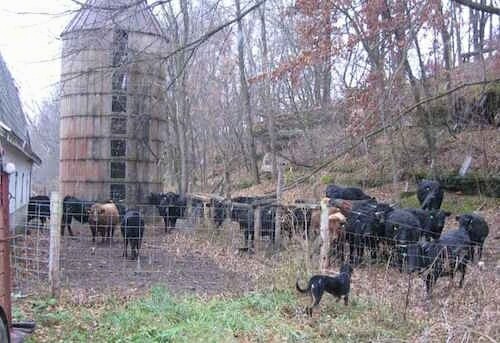 "Abbee the Beauceron at 8 months old working the cattle. She is a true natural." 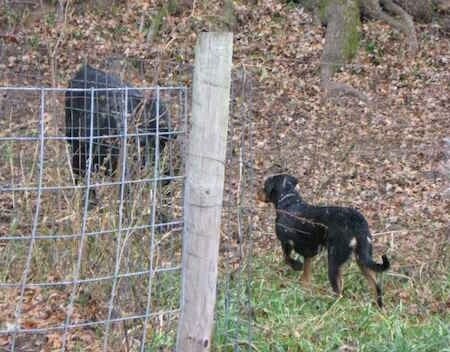 Abbee the Beauceron at 8 months old working the cattle. Beauceron puppy at 10 weeks old—"This is Glowing Ember de Nanrox aka Ember pictured at 10 weeks old. She is a very active puppy that enjoys playing with all sorts of toys and gets along well with the other animals in the house including other dogs, cats and chinchillas. She is very smart and learns fast with positive reinforcement and follows her humans anywhere they go. When she is old enough she will mostly participate in agility." "Classie ‘Ellita’ de Nanrox at 10 months lives in Quebec, Canada where she does very well in cold temperatures with her double coat. She is a great guardian and protector but warms up quickly to people when they are properly introduced. She is very obedient and intelligent." 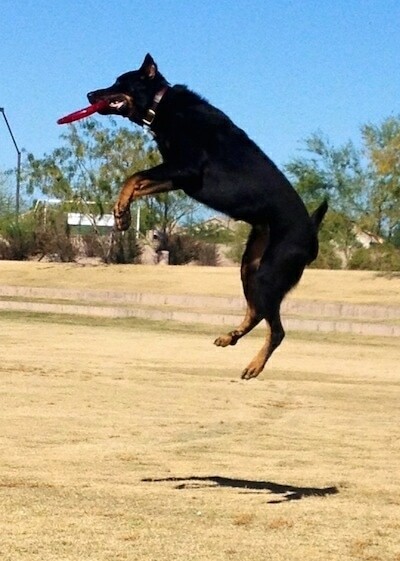 Taz the Beauceron at 3 1/2 years old catching a Frisbee—"Taz started out with a good home and then his family ran into difficulties, so the breeder took him back as a rescue which is how we got him for our family. He excels in agility, herding, Frisbee and tracking. Taz is good in all weather conditions as we have a home in Colorado and Arizona. Like all Beaucerons, he is somewhat aloof to strangers, but when he gets comfortable, he becomes a licking machine." 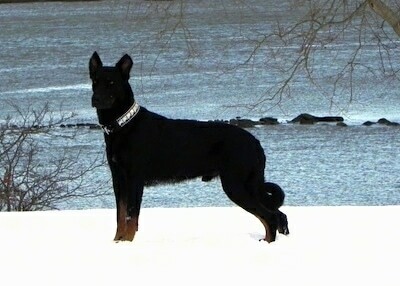 Haunter the Beauceron at 2 years old (UKC CH. Wandering Spirit Vom Wildweg CGC)—"There is only one breed of dog that can do it all.... Herding, Protection, Agility, Obedience, Drafting, Schutzhund. Tracking, Service Dog, Police K9, Flyball…. Introducing the Beauceron." "Ch. Wandering Spirit Vom Wildweg CGC "Haunter" is a UKC Best in Show Winner; when not in the conformation ring he enjoys practicing agility."